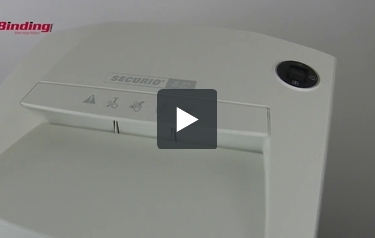 The HSM Securio B22s Strip-cut Shredder is perfect for small businesses. Capable of shredding up to 22-24 sheets of paper, can create 38 strip-cut particles per page, has a 8.7-gallon capacity of waste bin and an inspection window to monitor filling level. The HSM Securio B22s is perfect for shredding of tax documents, bank statements, and medical bills. It can also shreds staples, paper clips, credit/store cards and CDs/DVDs. This shredder can shred continuously with no down time and has a Zero Energy Stand-By feature that ensures no power is used while machine is in stand-by mode. Protect your business now with HSM Securio B22s Strip-cut Shredder. Hello and welcome to MyBinding video. Today we're checking out the HSM SECURIO B22. Part of their new SECURIO line, this is a great shredder. This shredder is perfect for keeping things safe in a small business. When it comes to shred capacity, this shredder comes in both strip and cross-cut patterns. Depending upon which one you get, it can shred from 12 - 24 sheets of 20-pound paper and when it comes to staples, paperclips, credit cards, no problem. These specially hardened solid steel cutting rollers can do the job, however on the B22; only the strip-cut model can handle DVDs and CDs. This machine has a great model but you can overload it, but there's a reverse button. Hit it, pull it out and start again. The safety and dust cover keeps away unintentional shreds. A window on the front allows you to see inside the 8.7 gallon bin and it shreds at a level 2 or 3 security, depending upon the style of shred. There it is. That's the SECURIO B22 by HSM. For more demos, reviews and how to's, check out MyBinding.com. Owning a paper shredder is a necessity for both businesses and individuals alike these days. There are many of these devices on the market so there is a wide selection to choose from. One of the better shredders is the HSM Securio B22s. It’s a pretty basic shredder, but sometimes less is more. We had a chance to test this device and discover its positives and negatives. Here’s a look at what we found…. The shredder’s feed opening is 9.45” wide so you can work with letter-sized documents without any problems. You can also use this machine to get rid of legal-sized paper. This is a Level 2 strip-cut shredder so it’s good for general shredding needs. Some of the things you can shred with it include e-mails, unwanted computer printouts, receipts, and envelopes. The Securio B22s has a waste bin that can hold almost 9 gallons of scraps. It’s a pretty large waste bin so this would be a good machine to use in a shared work environment. If you want to control the noise level in your office, this is a great shredder to use. It operates quietly so people will still be able to concentrate when the machine is being used. However, the motor is still thermally protected so it won’t overheat. HSM gave this device a pretty generous warranty. Labor is covered for 180 days while parts have a year’s worth of protection. Since the Securio B22s is a strip-cut shredder with a Level 2 security level, it shouldn’t be used to destroy classified documents. You should choose a different device if your business handles a lot of confidential information. This machine lacks the ability to shred multimedia items such as CD’s and floppy disks. As we said up above, the HSM Securio B22s is a pretty basic device. This is mainly due to its lack of multimedia shredding capabilities but it’s also because it has a Level 2 security rating. Since it offers a fairly low amount of security, it’s not recommended for businesses that deal with a lot of highly sensitive information. However, for general office use, it would be a great choice. It has a first-rate shredding capacity and it runs quietly so it won’t disturb the people in your office. Also, the waste bin is large so it won’t need to be emptied very often. Overall, this is a decent shredder, so check it out if it sounds like the machine for you.